I am by no means Irish, nor do I have Irish roots but I love cooking and baking with my daughter. I find it is one of the best ways to keep her from watching TV when she gets back from school. This week’s baking was all about Saint Patrick’s Day. We made these easy St. Patrick’s Day cupcakes. It was a great learning experience for her, as I discussed with her what this holiday means and why they celebrate. Teaching my children about other customs and cultures is important to me. I find it opens up their minds and will become more open-minded adults. At least, I hope so. These fun St. Patrick’s Day cupcakes have a secret. They’re not actually made from cupcake mix and sugary icing! Read on to find out what healthier swaps we made to cut down on the sugar and calories. Banana muffins or any other muffin recipe your child loves : For this St-Patrick’s Day cupcake recipe, I used a this banana muffin recipe as a base. 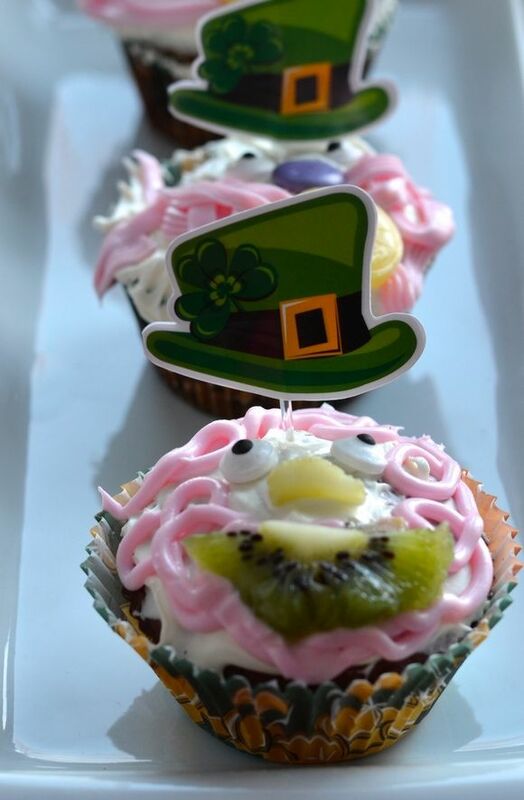 Saint Patrick’s Day cupcake decorations kit: Muffin liners, Hats, Wilton eyes. Bake the muffins as per the directions. Then let the child decorate. In a separate bowl, she added PINK coloring to the cream cheese. She wanted to have a PINK beard. I tried to talk her out of it but she insisted on having a PINK beard. Since it was her activity, I just let her do it. Then she made a smiling mouth with the kiwi. We have pink and green Saint Patrick’s Day Cupcakes. Don’t they look cute? They are also delicious. Plus, since you’re not using cake mix or sugary icing, they’re healthier than the average cupcake. Even my picky teen indulged in them. Now don’t forget to visit our friends from other blogs and see their beautiful Saint Patrick’s Day creations. I have to make these cupcakes with my granddaughter. She would love this so much ! Thank you for sharing with us !! these are adorable and look delicious! The fruit combination with the sweet sounds deelish! My kids would adore this! So cute! Very cute, mind you we would have to find something other than Kiwi because no one in this house will eat it. Love the idea of using a muffin as the base. Super clever and adorable. She is pretty talented. Like her Mom. These are adorable and I bet they taste fantastic. Great idea using some fruit for the topping. I love the fact that you frosted them with cream cheese and topped them with fruit! I hadn’t thought of doing that before. How awesome that you included all these healthy swaps! The kiwi makes this all come together so well. I never would have thought about using one. These are adorable! We will be attending a St Paddy’s day party and I just might bring these! Look at the little kiwi smile. Looks like a great reason to go buy some kiwi (which I love!). Those are super cute! I bet my kids would love these! The kiwi is a nice touch. 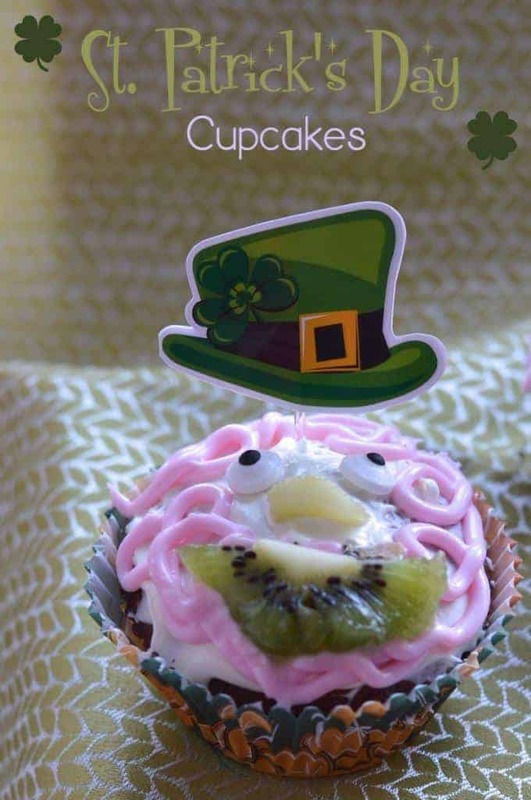 Thank you for your images and ideas for cute and healthier St Patrick’s Day cupcakes – and links to other recipes – very nice! These are super cute. Who doesn’t love a cupcake? And the added healthy addition makes them guiltless. Such a great idea,I will have to give this a try. I love these! I especially like the kiwi on top! What an adorable and unique cupcake! The kids will love those for St. Patrick’s Day and will have a great time celebrating. This is most definetly a unique cupcake design for sure. Who would have thought of using kiwi for the mouth. I love it. I love these St. Patrick’s Day cupcakes. They are perfect for celebrating this fun holiday. I seriously cannot believe it is almost March. For the love of Pete, time sure flies. 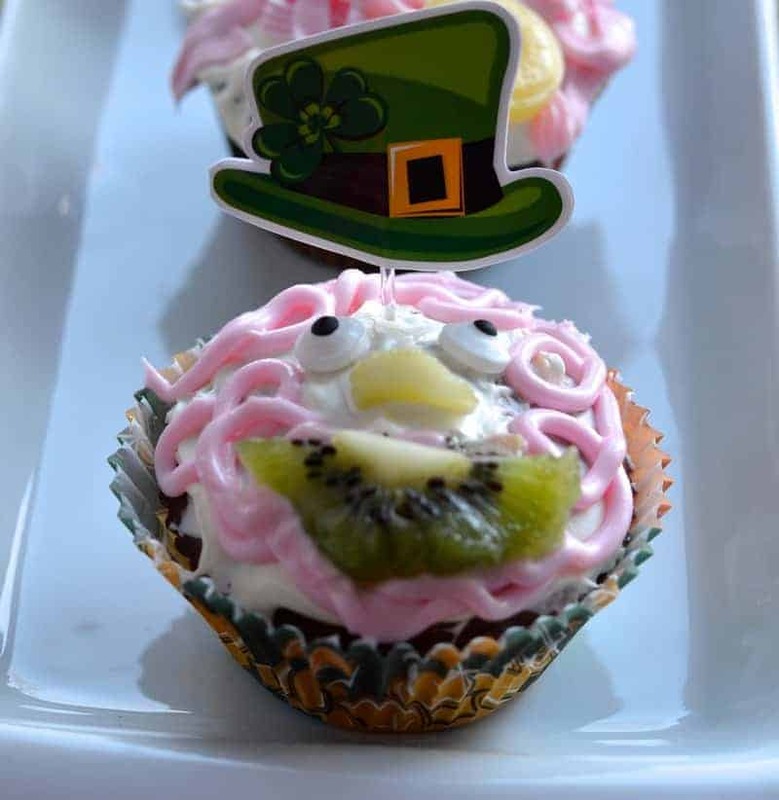 These are cute cupcakes, I like you idea to add kiwi. Oh those cupcakes are so cute! Definitively loving the twist and the kiwi! I love that you added kiwi on top! I love kiwi but I never get a chance to use it for anything. Okay, those are adorable! The kiwi is a brilliant idea! I really like what you choose to do with the Kiwi very cleaver. My 7 year old daughter and I watch cupcake wars and I have to show her this Idea she will love it. These are great! I love the addition of the kiwi! How cute those cupcakes are. My Grandkids would be so excited if I made these for them. Those are super cute. My kids would absolutely love those. What a neat idea. I love that you used a muffin as a base!